This article examines whether that claim is really true. Over recent years, low carb baking has become increasingly popular. With the popularity of low-carb and keto diets, more people are looking into sugar replacements for their kitchen. As a result, there are a vast number of natural and artificial sweeteners on the market, but is Swerve a safe choice? First of all, Swerve is a sweetener produced by a company of the same name: Swerve. Low carb dessert and baking enthusiasts love Swerve and use it for a wealth of different recipes. It can also be used as a straight swap for sugar to sweeten drinks such as coffee and tea. In this article, we will try to verify these claims of safety. First of all, let’s examine the three ingredients that Swerve contains. Erythritol: a sugar alcohol extracted from corn. Oligosaccharides: a fermentable pre-biotic fiber, otherwise known as inulin. Swerve comes in two varieties; one is granulated, which has a texture similar to regular table sugar. The sweetener also comes in a powdered confectioner’s style. Erythritol is the main ingredient in Swerve, and it is a sugar alcohol derived from corn (1). While it looks and tastes similar to sugar, it has almost none of the calories. Alone, erythritol is approximately 60-70% as sweet as sugar (2). 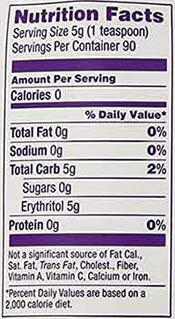 Despite its “natural” reputation, erythritol is an industrial product. As part of its manufacture, a hydrolysis process extracts glucose from corn. Next, the producers add a type of yeast — often Moniella — which ferments this glucose. Finally, the product is cleaned by filtering and then undergoes a crystallization process, resulting in erythritol (3). Surprisingly, the initial discovery of erythritol came way back in 1848, Scotland (4). According to Swerve, their erythritol is certified non-GMO. Oligosaccharides are a type of prebiotic fiber that naturally occurs in various plants (5). Swerve uses an extract of this fiber initially derived from vegetables. Although the manufacturer does not disclose the exact source, we can guess based on the plant foods that are high in oligosaccharides. Typically, the sources of these sweet-tasting compounds are vegetables such as chicory root, garlic, leek, onions and scallions (6). Oligosaccharides add to Swerve’s sweet taste, and as they are prebiotic fiber, they may provide some benefits for our gut bacteria too. Food products often label this ingredient as ‘inulin,’ which is a common alternate name. While ‘natural flavors’ certainly sounds better than ‘artificial flavors,’ they are not so different in reality. Artificial flavors are entirely human-made in a lab using synthetic chemicals. On the other hand, natural flavors use a chemical initially found in nature. After extracting and modifying this ingredient, it is then mixed with various other things. In fact, these ingredients can number in the hundreds, and the extraction process often uses solvents (7, 8, 9, 10, 11). Sadly, the legislation surrounding the use of the term ‘natural flavors’ is lacking. Providing an extract originated from food, it doesn’t matter what happens next. In other words; that extract can be fried, boiled, mixed with various solvents, or anything else the flavor producers want to do. Personally, I view ‘natural’ and ‘artificial’ flavors as the same thing; neither is something you will find in nature. How Are Swerve’s Natural Flavors Made? Unfortunately, this information is not public. The official Swerve website advises that the natural flavors are “from citrus,” but we already know that natural flavors must originate from real food. The real question is; what process is used to make the flavors? Unless this information is made available, we don’t know. Key Point: Swerve sweetener is a combination of erythritol, inulin, and (not so) natural flavors. How Many Carbs Are In Swerve? While Swerve sweetener’s label claims to be ‘zero-calorie,’ this isn’t entirely accurate. For example, according to the FDA label requirements, anything containing less than five calories per serving can be called zero-calorie (12). The serving size for Swerve is listed as one tsp (4g). While this might be okay for a cup of coffee, baking recipes call for cups rather than teaspoons. Despite this, the actual calorie content is still reasonably low; Swerve contains 51 calories per cup serving. Concerning carbohydrate, Swerve sweetener has 5g carbs per serving. Although this sounds very high, the body doesn’t metabolize these carbs. As a result, erythritol is non-glycemic and does not affect blood sugar and insulin levels (13). Key Point: Swerve contains 51 calories per cup and a small amount of carbohydrate. However, these carbs have no impact on blood sugar levels. To understand the safety profile, we have to examine each of the ingredients. Erythritol is the main ingredient in Swerve sweetener. I set out trying to find both positive and negative impacts of erythritol, but the studies are generally positive. 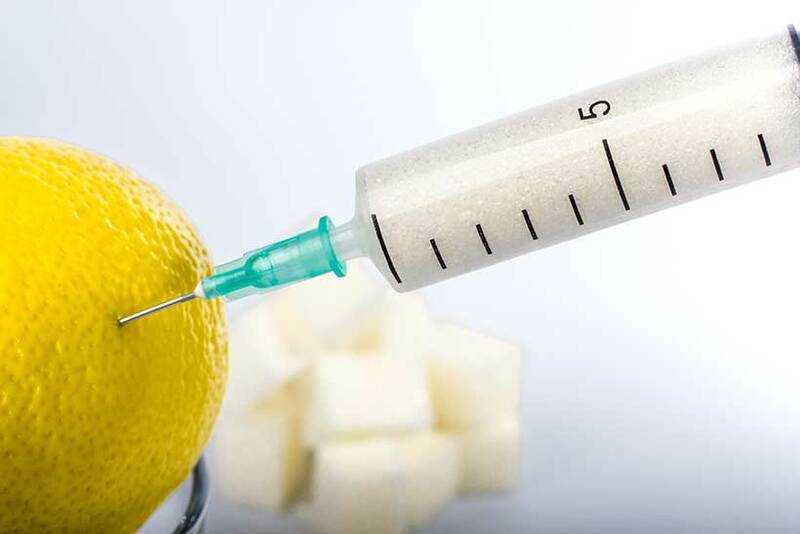 In a study looking at pre-diabetics, a daily dose of erythritol for two weeks did not affect blood glucose levels (14). Additionally, unlike natural sugars, erythritol appears to have a positive impact on dental health. Studies show that it inhibits harmful bacteria and reduces plaque – even more so than xylitol does (15, 16). And most significantly, toxicity and carcinogenicity tests on erythritol show that it’s very safe for humans. Studies testing high-dose ingestion show no adverse gastrointestinal response. Further, long-term animal studies show no signs of any tumor-promoting effects (17, 18, 19). Overall studies on inulin appear to be very positive. Daily supplementation of inulin over a 16-day period improves the diversity of the human gut microbiota. Also, randomized controlled trials show that inulin improves inflammation, intestinal permeability and overall gut health (20, 21). Inulin may also hold promise for reducing insulin levels. In a double-blind, randomized controlled trial, participants supplementing inulin at 10g per day had significantly reduced fasting insulin levels (22). Another study also shows that inulin had a significant effect on decreasing fasting glucose levels in forty-four subjects with prediabetes (23). Of course, these doses are much higher than what you will find in a few servings of Swerve sweetener. However, they do show that oligosaccharides are beneficial for health rather than something to cause worry. As previously mentioned, ‘natural flavors’ can include hundreds of different ingredients. Therefore, it is difficult to know precisely what these ‘natural flavors’ contain. People with diabetes are some of the biggest consumers of low-carb sweeteners. Therefore, it is essential to know what effect Swerve may have on blood glucose and insulin levels. As shown while discussing the various ingredients, nothing in Swerve appears to impact blood sugar adversely. In fact, it appears that these ingredients may reduce fasting glucose levels. However, it is important to note that anyone with diabetes should always discuss dietary changes with their medical team. For one thing, using Swerve as a replacement for sugar may require existing medication doses (such as insulin) to be lowered. Is Swerve Safe For Children? Unfortunately, there is nothing specific in the literature concerning the safety of the ingredients in Swerve for children. However, there is also no reason why it should cause harm. After all, children and adults are not so different biologically. Furthermore, the FDA would not allow a baking product to go on sale if it was explicitly harmful to children. It is worth remembering that children are little, though, and this means that their digestive system is only small too. As a result, any digestive sensitivities to erythritol would be “felt” at a lower dose than what a fully grown adult would experience. If a child displays any discomfort after trying food containing Swerve, then its use should be discontinued. One potential adverse effect to be aware of is that sugar alcohols, including erythritol, are capable of causing mild side effects. These side effects revolve around high-dose consumption causing slight digestive discomfort such as bloating and gas. The reason this can occur is that we don’t fully digest sugar alcohols and they are left to ferment in the intestines, which leads to the above symptoms. However, these side effects of erythritol are uncommon in anything other than high doses. For instance, controlled studies demonstrate erythritol is “well-tolerated” at repeated daily doses of 1 gram per kg of bodyweight, for seven consecutive days. Key Point: Generally speaking, the ingredients in Swerve Sweetener have positive effects on health. However, the unknown nature of the natural flavors is not ideal. How Does Swerve Sweetener Compare To Stevia? Both Swerve and stevia are natural sweeteners, and many people wonder which one is best. The truth is that both these sweeteners are reasonably good choices, especially in contrast to their artificial alternatives. Stevia has a mild, slightly bitter aftertaste which some people dislike (24, 25). It’s also not as well suited to baking as Swerve is. For instance, Swerve serving sizes are simple because it’s a like-for-like, cup-for-cup sugar replacement. In contrast, working out the required serving size of Stevia necessitates some guesswork. Two kinds of stevia exist; refined and whole-leaf. While the refined version is similar to Swerve concerning the natural flavors and unknown ingredients, the whole-leaf version is not. Whole-leaf stevia is merely the dried green leaves of the stevia plant; nothing is added nor taken away, no extractions, and it is 100% natural. However, whole stevia leaves are much milder in sweetness, and they would not be suitable for baking. Key Point: Stevia and Swerve sweetener are quite similar. If the taste is your top priority, then go with Swerve. If you want something as close to nature as possible, go with unrefined stevia leaf. Natural sweeteners and artificial sweeteners are similar in some ways. First, they are both very sweet, contain no digestible carbs, and substitute for sugar in many foods and drinks. However, when it comes to their safety profile, there is one clear winner: natural sweeteners. The links between artificial sweeteners and cancer, weight gain and gut health are unclear. While some studies find connections, others do not. However, in the interest of balance, there are also many studies showing no link between artificial sweeteners and illness (36, 37, 38, 39). But why take the chance of using artificial sweeteners when we can use something that appears to be much safer? Key Point: Natural sweeteners such as stevia and Swerve have a much better safety profile than artificial sweeteners. Despite no consensus on artificial sweeteners, they are controversial. Can Sweet Taste Lead to Sugar Cravings? One of the most intriguing and evolving areas of research concerns sweet taste perception. Sweet taste has an impact on the ‘reward center’ of our brain, activating dopamine receptors. This action may profoundly influence satiety and the amount of food we want to eat (40, 41). Researchers query whether this might be the reason for artificial sweeteners having a link to weight gain; perhaps they decrease the satiety response and thus encourage over-consumption of food (42). However, most of this research is on artificial sweeteners and, unfortunately, very little exists on erythritol. Could “natural” sweeteners like Swerve sweetener have the same effect on dopamine receptors? With this in mind, it may be better to avoid any form of sweetener should you be prone to sugar (or sweet taste) cravings. Key Point: Artificial sweeteners may impact the reward center of the brain in the same way sugar does. However, little research is available on erythritol, the main ingredient in Swerve sweetener. Swerve sweetener is available in many health stores, including Whole Foods. If you cannot find it offline, then you can also buy on Amazon. If you buy this product, then you will probably want some ideas for what to do with it. Just to repeat; it is a like-for-like sugar replacement, so you can use it in the same amounts as you would use sugar. See here for some delicious Swerve recipes. Is Swerve Good or Bad For You? 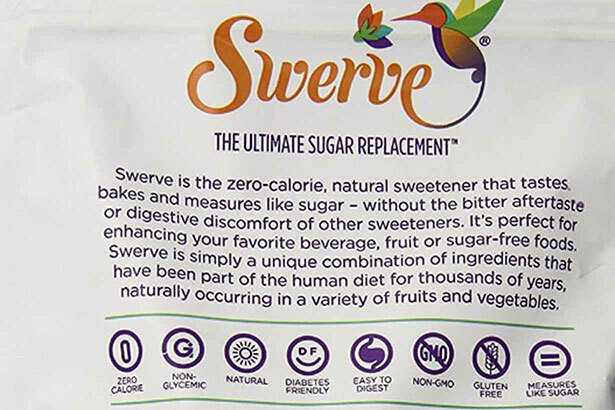 So, is Swerve sweetener a healthy replacement for sugar? Well, sugar is one of the worst ingredients in the modern diet, and Swerve certainly makes a great substitute. Despite this, the safety profile of Swerve is relatively good, and there are no standout concerns. All in all, there is nothing wrong with using it for an occasional sweet treat. But it is always best to base diets around nutrient-dense whole foods. Tried Swerve for the first time at Costco yesterday and I was impressed. I definitely recommend it anyone looking for a sugar substitute. I am a big fan of Splenda but I think that Swerve may be better. Costoco sold a bag that appeared to be about 5 lbs. for $19.99 US. Wow, that sounds like a good bargain – it usually costs a fair bit more than that. Good spot! Our local Supermarkets in Australia don’t sell ” Swerve ” so I don’t know what it would taste like and would like to try it, especially now that I want to start a Keto diet and my recipes are all American and I don’t what the equivalent to Swerve would be. In that case, you could try just pure erythritol (which is the main ingredient in Swerve). The taste may be slightly different, but it is almost exactly the same. I just tried them both for the first time the other day and the Swerve wins hands down. I don’t know how anyone can torture themselves with the Stevia. Was it because of stevia’s bitter aftertaste? Thanks, I found this article very well researched and informative. Thanks Mrs. Ruscica, glad you found it helpful! Also I’m confused—if a recipe says “stevia” is that the brand name? And if it doesn’t state, do I assume granulated, powdered, or liquid? “Stevia” is the name of the sweet extract derived from the stevia plant. There are many different brands/companies who make “stevia” products. If it doesn’t state by mentioning drops/spoons, I would guess from the amounts mentioned. Liquid doses are tiny (way less than a gram). For granulated vs powdered, it is harder to know, but granulated stevia usually contains fillers and so the amounts tend to be higher. My recipe calls for 1 1/2 tsp stevia/erithrytol (I’m assuming granular?) What is the conversion ratio to substitute the stevia for Swerve granulated? Sorry, it is a little difficult to work this out because it sounds like it is a stevia/erythritol granular blend the recipe is using and I’m not sure of the ratio/amounts. However, the conversion rate for Swerve and sugar is 1:1. So, if your recipe mentions the equivalent amount of sugar, you could work it out this way. I also found a conversion chart saying that stevia/erythritol blends are twice as sweet as sugar. In that case, the amount you need would double to 3 teaspoons. Does this sound about right for the recipe? Oh dear, I’m sorry to hear that! Yes, stevia is very concentrated, and it is much sweeter than erythritol/Swerve and most other sweeteners. Good luck if you attempt it again! Is the corn used non-GMO? According to Swerve, their product is certified non-GMO. I am really happy to find a sweetener without the bitter aftertaste. Although I will not totally reject natural Stevia. I will use Swerve or Stevia with some sugar. That way I can cut my sugar intake at least in half if not even more. Yet I will not take from either enough to hurt me in any way I believe. Thank you . I am glad I can find Swerve now. Glad that you’re finding that Swerve works out well for you. Cutting your sugar intake in half would certainly be a good achievement! Hi great article thanks! could you tell me how I can convert 1/3 cup swerve to a powdered stevia? That will depend on the exact powdered stevia… some of them are 100%, but others are mixed with various fillers. Swerve is a gram-for-gram replacement for sugar, so you can also use any conversions for regular table sugar to work it out. Yes, that’s fine. No conversion is necessary, so if you need a cup of sugar, a straight replacement with one cup of Swerve would work fine. I’ve been using Swerve and am delighted to have it as a sugar substitute. However a host of health conscious people are taking note of a growing difficulty with sweet addiction. What next. The only sweets I have in my diet not creating a desire for more are the darker berries I mix in my whole grain and oat cereals. I think it is true that some people may have an issue with sweet taste as a trigger. We have to look at that from our own personal experience rather than anecdotes though; if it’s working well for you, great. If not, it may be better to avoid it. Thank you very much – I started the Keto diet the last week of August and I am down 29 lbs. I just made some Keto fat bombs today (chocolate and peanut butter bombs) and also (cream cheese with strawberry bombs). I used Swerve and I was interested in learning which is the best choice for me to make – sound to me the the Swerve is a good choice. Thanks so much for the article I appreciate it. Glad you found it helpful (and those fat bombs sound rather tasty too). Congrats on your progress so far, 29 lbs in such a short time is good going! I just tried Swerve the first time tonight, and was very impressed. I am sensitive to every other fake sugar (and I have tried them all), but I was not bothered by the Swerve at all (I am also leery of artificial sweeteners because of the possibility of developing cancer). Your article was very informative and helpful to me. Happy that it was helpful, and I’m glad that Swerve worked well for you. As for the artificial sweeteners, I think a lot of the negative things online are exaggerated, but I’m a bit wary over their potential impact on gut health – more studies are needed on that. Very in depth, many thanks, but I’m wondering what you mean when you say that although high in carbs they aren’t metabolised? Would be very grateful for any more info on that, have never heard that. Thanks. Basically, erythritol is a type of sugar alcohol and we don’t have the required enzymes to break it down (https://www.cambridge.org/core/journals/british-journal-of-nutrition/article/human-gut-microbiota-does-not-ferment-erythritol/87A2797F505A71C1E5EA3ADDD2E2A166). It is technically a source of carbohydrate, but it remains undigested until it is excreted via urine. Swerve is my no. 1 go to alternative sweetener. If you’re on no/low carb or Keto, sweeten heavy cream with Swerve to taste, add a little vanilla to tast, shake it well & store in fridge for the perfect coffee creamer. Note: Steer clear of Splenda or Equal. They’re toxic. That sounds like a tasty recipe – creamy vanilla coffee is great. I also like vanilla heavy cream over mixed berries! Thanks! Can you tell me if there are any vegan protein powders that are not sweetened with anything (not stevia, nor swerve, nor xylitol, etc). I would like to make my smoothies by just adding dates, bananas and raisins for sweetness, but still have the added protein. IS it ok to mix swerve with regular sugar? If you are just trying to reduce the amount of total sugar, then there is no reason why you can’t. I was diagnosed with Type 2 Diabetes about 2 1/2 years ago, and despite my well-developed sweet tooth, I immediately corrected my diet. I was on a mission to find a good substitute for sugar, though. I really, really dislike Stevia, I can’t stand the bitter aftertaste. I like Splenda, but I know it is not really good for the human body. I tried Swerve in several recipes last Thanksgiving, and I was very pleased with the flavor. My only gripe is that it is so expensive! Yes, unfortunately… it is a lot more expensive than plain old sugar! However, I suppose it is OK if used as an occasional treat. At least you found something that works for you! Glad that it is working well for you, Terry! The real ice cream sounds nice, but I don’t have an ice-cream maker. With summer here and reading your recipe, maybe I should look into getting one! I would like to try Swerve I recently tried two packets of stevia in some ice tea and ended up with 3 blisters on the backside of my bottom lip!!! I have a lot of allergies to trees, grass and pollen, so that really scared me because I thought it was safe. Wow, I didn’t hear that about stevia before. Was it definitely the stevia? Hope your lips are better now! I also had reactions and found out that stevia is related to ragweed! Allergy sufferers beware! Just to point out: Swerve doesn’t contain any stevia – it’s a blend of erythritol and inulin. Sorry to hear that it didn’t work well for you, though! On their website, Swerve states they make the erythritol through a natural fermentation process using microorganisms in brewery tanks. This is different than the way typical erythritol is make, correct? Not really – all erythritol is made by “naturally” fermenting glucose. However, this glucose is still extracted from corn via hydrolysis, and then after fermenting it is filtered and crystalized. So, it isn’t really a “natural” product aside from the fact that it was originally located in corn at one point. That doesn’t have to have a negative meaning though. Some natural things can be harmful, some refined things can be fine. Hello! What about Bochasweet? I’ve used it and it helped me lose so much weight on the Keto diet, but there’s nothing out there about it. It tastes amazing and just like sugar. Only downside I see is the high price! But I could be wrong! I’d love to know what you think/find out. Hi! Interesting, there isn’t a lot of information on this one. Will need to do some research into it and the production process! So.. If most (if not all) corn is genetically modified and one wanted to lessen the amount corn in diet.. not to mention allergies to corn. In addition, yeast is an issue or something you want to steer clear from.. this would not be an ideal alternative.. for those reasons. Correct? Michael, has there been any testing on erythritol when it comes to Glyphosate (Roundup) residue, which is heavily used in conventionally grown corn? I assume that this wouldn’t be an issue since erythritol is just the (heavily refined and fermented) extracted glucose, but I can’t say for sure. There is some interesting research on aspartame and sweet taste cravings, but I don’t think there’s anything concrete right now. I think there might be something to it though! Glad that Swerve is working well for you. Healthier peanut butter cups sound good! Peanut butter cup Recipe plz!! When a recipe calls for 1 packet of Stevia, how much Swerve is that going to be? Is the stevia just 100% stevia powder? If so, it would be 2 tsp of Swerve. Please provide links to the long term safety studies on Swerve that you mentioned in your article. Thank you! Hi Janet – those are long-term safety studies on erythritol, which is one of the ingredients in Swerve. Following all mentions of studys/health claims there is a little clickable number in brackets that will take you to the studies – please see and click (17, 18, 19). I have a recipe that calls for 2 Tbsp of Splenda. How much Swerve would I use in place of the Splenda? Most people recommend a ratio of between 1 to 1 and 1.5 to 1. It isn’t quite as sweet, but it isn’t too far away. So between 2 and 3 tablespoons depending on your sweet preferences sounds about right. Thanks for the article. I have been a vegetarian for many years noe, but have recently become dairy free due to health problems but do like to bake and looking at recipes that have included Swerve and hadn’t heard of this before. I have used other artificial sweeteners but hate the aftertaste of saccharin and stevia so will purchase this and give it a try. Thanks – yes, saccharin and stevia definitely have a strong aftertaste. Hopefully, this one will taste a bit better for you. Good luck with it! Thanks for providing a link to actual research! I like Swerve but I was worried it could have a negative effect because it seems “too good to be true.” I can use it with confidence now. What is the story on Maltodextrin? Maltodextrin is basically sugar, approximately 95% carbohydrate by weight. Isn’t maltodextrin derived from corn? How is it then basically a sugar? Yes, correct – maltodextrin is derived from corn. Technically it isn’t a sugar, but it has a glycemic index of over 100 (regular table sugar is only 65) so the action it has in the body is basically the same as a sugar. This is the main reason why it’s in many sports drinks/post workout recovery formulas. Glad that you’ve found something that works well for you! Of course, desserts aren’t the healthiest things in the world, but this is so much better than eating typical desserts and needing more insulin. Hope the strawberry quick bread was tasty! A few weeks ago I switched over to erythritol in my coffee instead of Stevia In the Raw. I found myself carb-hunting because my body (apparently) noted the absence of the maltodextrin that is in in SitR. It just takes a few weeks to adjust. I also prefer Swerve over xylitol because I have pets (xylitol can be deadly for dogs). Yes, it’s really important to be careful with xylitol if there are dogs around. Erythritol is a nice choice and doesn’t appear to have any major negatives. Great article. I learned much. I had never heard of Swerve. I use Stevia and no sweetness in baked goods. Mostly muffins. I use nuts and fruit instead. Thanks. Nuts and fruit sound like a great natural sweetener! No one has mentioned the cool effect Swerve has. I find it slightly unpleasant, like an aftertaste. It is a little chemical. This made me question whether it was healthy. However, it is definitely an improvement over the bitterness of Stevia. That comes from the erythritol (it’s the same with the pure erythritol too). The taste is also similar to Xylitol; if you’ve ever tried any kind of sugar-free mints then there’s a similar taste there too. It actually leaves a menthol type feeling on my tongue and gums… not sure if I actually like it! That menthol type feeling is from the erythritol. Other sugar alcohols such as xylitol do the same thing… which is why they are always in chewing gum/breath fresheners/toothpaste etc! Is xylitol as safe as erythritol? Which is better for a diabetic? Great article by the way. Just heard about Swerve and am interested to try it even more now since reading the information that you provided. Thanks! Both xylitol and erythritol are sugar alcohols; their carbohydrates are non-digestible and will have zero effect on blood sugars. The only thing I’d watch out for with xylitol is if you have a dog – it can be really dangerous to animals. Swerve is a good choice! Just had my first experience with Swerve. Where has it been in my life?! For those who’ve mentioned drinking coffee and being worried about blood glucose levels, be aware that caffeine raises blood glucose levels all by itself. Look it up! What did you use the Swerve for? Coffee’s an interesting one – it can either be beneficial or detrimental depending on the person. Some people can drink it all day long like water, while others can barely tolerate a cup! Or even Trader Joe’s liquid stevia? I Use it only in my coffee but drink about 3 cups a day. What about “Just Like Sugar”? I currently use Trader Joe’s liquid stevia not sure if this is great and if I would be better to change to “Just Like Sugar”. Do you know anything about this product? Thanks. Yes, both are not bad as far as sweeteners go. “Just Like Sugar” is pretty good and one of the cleanest out there. This is not metabolized as glucose like sugars and starch are. However, this is a medical issue so you need to speak to your doctor or a medical professional about this to be safe. Is this safe for people who are allergic to corn? The allergen is usually in the corn protein, but it’s better to be safe so I would avoid it personally. Maybe whole stevia leaf or ‘Just Like Sugar’ (http://www.justlikesugar.com/just-like-sugar/) would be a nice replacement option. Both are pretty natural as far as sweeteners go. Yes, I think it’s definitely one of the better options (along with stevia) in regard to taste and impact on cravings. Some sweeteners have been shown to impact insulin levels, and this one has numerous studies showing that it doesn’t. To be honest, I like my coffee just as it is, but I do enjoy the occasional use of this for baking. I’m new to keto and logging all my carbs. How should carbs be counted using Swerve? I wouldn’t count Swerve as carbs. It is a sugar alcohol and only minimal amounts are absorbed – about 90% of it remains undigested. I also know what you mean about feeling like cheating. Personally, I think it’s better to mainly stick to real whole foods…but if someone’s going to “have a treat”, this is a lot better for them than sugar! Swerve is a great choice for low carb baking. I do think that sweet foods can cause a craving for more… but I’ve never experienced (or heard of it) with erythritol/swerve. Some people get into a cycle of reliance on sugary foods though – and many of them don’t even realize the situation because it’s just part of their normal day. As for your recent success with weight, it’s better late than never 🙂 Keep up the good work and let me know if you have any tasty recipe ideas!! Sue, I’m with you. I have suffered with my weight all my life, now almost 70, its’ still my nemesis. I have never had weight loss surgery, but now trying the Keto diet and I’m coming along “ok”, but think I will start using Swerve as much as I can. All substitute sweeteners cause me to crave real sugar or more food. They have all my life and nobody ever believed me until now. There is a bit of research on this, and many researchers believe it may be an effect of sweet taste perception. I have been on the Keys way, but I have been using Monk Fruit and I think it caused me to gain 4 lbs. I was craving the cookies I made. Then I was told that Swerve would be better for me. I’m not so sure now. I am type 2 diabetic. I need to be real careful. If you feel sweeteners give you a craving for sweet food, it may be better to avoid them altogether. I’ve heard of this happening before, but it usually tends to be with the artificial sweeteners. Hi I’ve been reading recipes with Monk fruit sweetener too and have never heard of it here in Australia. Can you please tell me about this sweetener substitute? What about GMO corn? Does the inserted insectacide make it through the prossesing? It will change the gut and set up a new or differant microbiome. Good news: Swerve Sweetener uses non-gmo corn. That is good news. I am preparing to use it as a sweetner in making canned Guavas. Sounds good! Although guavas are already quite sweet… or is it just me? Awesome to know! I was very concerned about this. Thank you so much! Thanks Lauren, glad you liked it. Also virtually no (minimal) response. and the insulin response levels, rather than the blood glucose levels ? What Is Allulose and Is It a Healthy Sweetener?